The folks over at CoinNews.net are reporting that two huge California Gold Rush era assayers’ ingots, recovered from the famous SS Central America and with a combined weight of over 100 pounds of gold, will be exhibited at the next Long Beach Coin, Stamp & Collectibles Expo, September 10 – 12, 2009, in the Long Beach, California Convention Center, 100 S. Pine Ave.
During the three-day Long Beach Expo more than 1,000 dealers will be buying and selling rare coins, paper money, stamps, postcards, historic documents, antiques, estate jewelry and other collectibles. 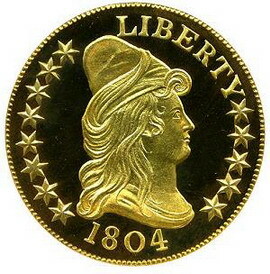 Some dealers will provide free, informal appraisals on gold coins and other items for visitors. A free gold coin will be awarded daily to a registered visitor. Young numismatists’ activities include a children’s treasure hunt, educational programs, and collectors’ clubs meetings. Heritage Auction Galleries of Dallas, Texas, the world’s largest collectibles auction house, will hold a public sale of U.S. and world coins and paper money. The public hours of the Long Beach Expo are Thursday and Friday, September 10 and 11, 2009, from 10 a.m. to 7 p.m., and on Saturday, September 12, from 10 a.m. to 5 p.m. (The show is closed on Sunday.) A complete Schedule of Events is online at www.LongBeachShow.com. General admission is $6 (good for all three days); $4 for members of any coin or stamp club who display a valid membership card; and $3 for seniors 65 and older. Free admission for children ages seven and younger. Discount coupons are available online at www.LongBeachShow.com.